I'm rocking a new C.L.E. Clothing Co. shirt today. 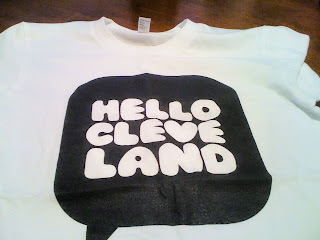 I bought "Hello Cleveland" a couple weeks ago. With the holidays coming, I think these shirts will make great gifts for the wacky t-shirt loving person in your life. Especially if they like locally produced goods. If you're at the Tremont Art Walk tonight and you see a brunette rocking a C.L.E. shirt, it might just be me!